The best resort experience in the heart of the city. My studio condominium unit is best for couples, friends and small family who want to tour Cebu City. The studio unit has the best location in the condo. It is right in front of the amenities like the clubhouse and the swimming pool. It is very accessible to malls, beaches, tourist spots and best hang outs in the city. It is situated in a residential area but very accessible and in a gated and secured place. Away from the hustle and bustle so you can sleep soundly. I’m glad we returned to Cebu after these many years, and your location gave us a look-see into where to invest. Thank you for your kind hosting of us, Dev. You were responsive, accommodating and attentive throughout our stay... As a result, we have enjoyed our stay. Communications were somewhat challenging however with Admin staff onsite. I found this to be common with properties that are not set up as condotels as residents are often concerned with outsiders. I myself have a property, that though is not rented, every time I have family and guests in the unit, the building managers are often leery of occupants thus creating an air of discomfort for guests. We understand their concerns thus it remains a constant challenge to remedy the situation. Strained conditions are best alleviated by open communication and thorough orientation but motivations from both sides need change. I believe there is always a win/win approach. Property managers and admin staff should embrace the concept that residents and guests can harmoniously co-exist and still effectively assert and enforce policies, not passively and aggressively; if the goal is to avoid unnecessary tension between guests Admin staff; especially when there is a language barrier. Overall, we believe the breakdown is in communication. We have learned important lessons here during our stay that gives us food for thought on our next trip. 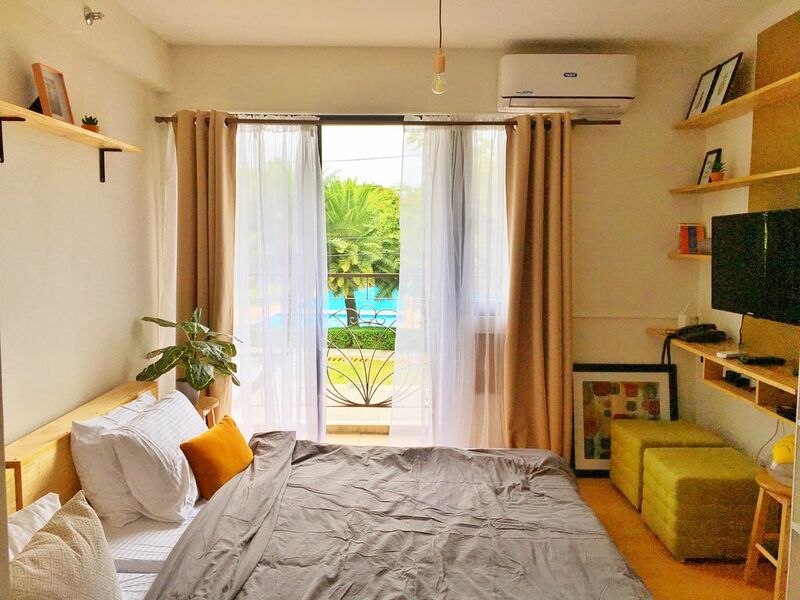 The unit is well located within the property, air-conditioned, well furnished and supplied with the necessary items for a longer stay; the water supply and the wifi is a plus++ and were much appreciated. Bed sheets were clean and smelled fresh! The view of the pool and sports court from the unit make the studio feel larger and spacious. If I may add, a floor fan should be added to enhance the effectiveness of the existing AC. We had an awesome stay at Dev's place. It was clean, comfortable, and easily accessible for us. Will definitely recommend it! It is all said above, the place was perfect Host perfect, maybe the location is not # 1 but ll the other good things offered makes up for that. I would stay there and recommend the place, swimming pools are perfect the outside rest area perfect and I met good fun people out there too enjoying their times interacting and all.The cleanest place I have ever been in the Philippines. I felt very, very comfortable and I am sure other guest will feel so too and I am a quite demanding person when it comes to accommodation, and that place and price made me happy!!! Thanks for your kindness Dev !! I will be back again! !